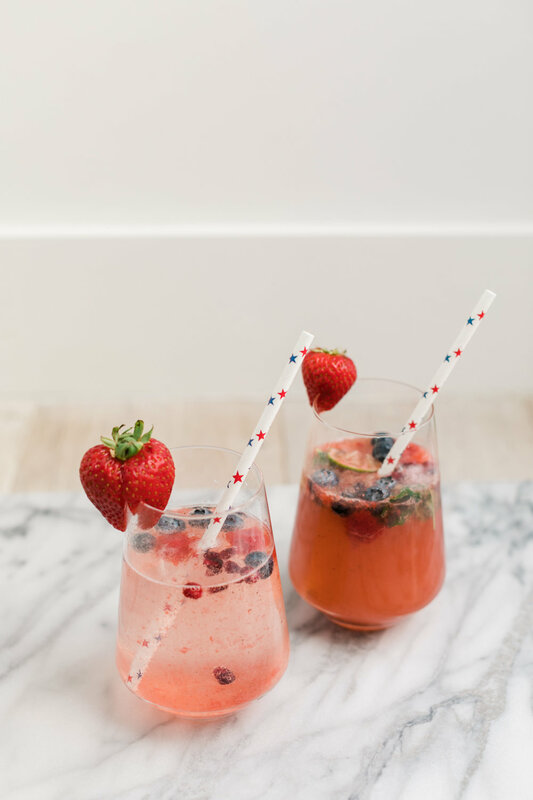 I mean let's be honest, a 4th BBQ usually entails a cocktail or two, so why not make it a festive one? These bad boys are red, white and blue thanks to the fruit and the fruit purees. I even made a popsicle to toss in there. I mean what could be better on a hot day then a refreshing, and healthy popsicle? Hull strawberries and place in a blender. Squeeze half the lime and add half the mint leaves and the honey. Blend until smooth. Strain through a fine mesh sieve (this is optional but I like to get any seeds or chunks out). ~At this point I placed some of the puree in star molds to create the cute little ice cubes. Place 3 tbsp strawberry puree in glass, add 5 mint leaves and two slices of lime. Muddle in glass, then add shot of rum. Top off with club soda or lime sparkling water. Add a few strawberry star ice cubes, blueberries and enjoy!